Here are the pros and cons of the Lambo or scissor door, suicide door and gullwing door conversions. 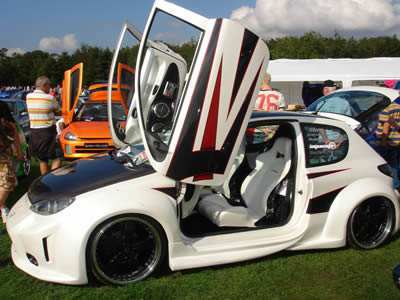 Lambo doors can be hard to close from a seated position so thought has to be given to the handles. Drop handles will make this easier or you go for the very impressive electronic opening and closing lambo doors. Suicide doors are relatively straightforward to live with but you will find yourself reaching for the wrong side of the door when using other peoples cars which can look a little strange. The hinge of these doors is at the top of the door and the door swings out and upward must like the wings of a bird in flight. 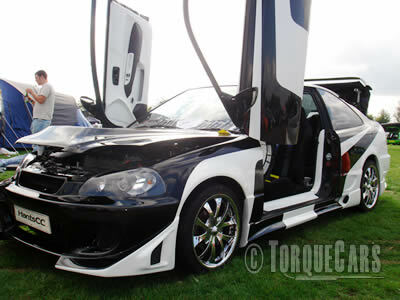 These doors look as impressive as Lambo style doors and have not become as popular. This style of door was made popular in the Delorean of Back to the Future fame. One thing to bear in mind with this is that the doors require a slightly wider opening space so if you parked in a car park and the cars either side of you parked too close you'd be unable to get into your car. Probably best not to fit these on your supermarket run car! For more information on Gullwing doors.